So at the moment, I'm loving the whole sort age of Aquarius vibes with the bohemian and hippy fashion taking precedence. 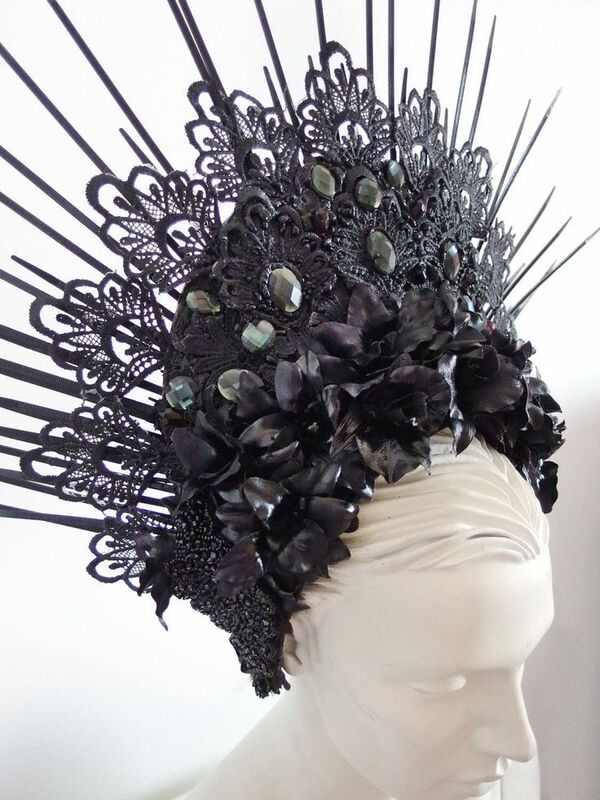 In both alt and mainstream fashion headdresses seam to be everywhere. I've sort have been admiring this trend from afar. There are some gorgeous headdresses to buy. Yet, the cost is anywhere from a few pounds to more elaborate handcrafted ones going to the hundreads. 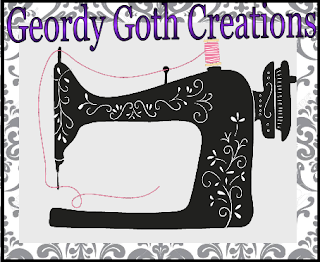 Its out of my budget at the moment, espcially since I want my craft room decorated. Anyway, I admire and respect these independent artisans who are creating beautiful items, however, I understand their prices needs to reflects their labour, time and materials. I try my best to purchase from independent sellers, presently my budget is the quite tight so it's going on my wish list.. 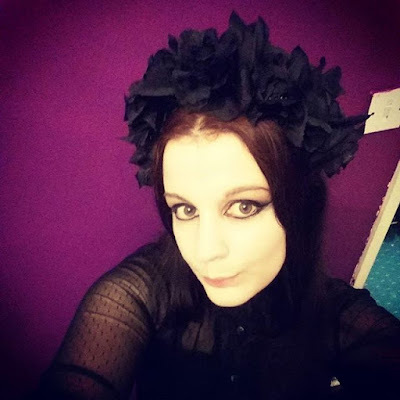 So, I decided to diy one a floral headdress with the assistance of Angela Benedict tutorial on how to create a floral headdress. The video was really good for instructions. I've tried to explain to my best of my ability. If you like me sometimes a visual Youtube video is far more effective. I'm too lazy and tired to make my own. I purchased a headband for 30p from Home bargains, I picked up another two for another project. I had some black faux flowers from a cheap shop for a pound and some gorgeous green leaf trim from Tiger, I love this shops. All materials came to £2.30 and a couple of blisters. I used a glue gun. I got mine from Asda for £5 - £6 and refills are 60p ( from Asda). I measured the trim by placing around my headband to get the right size and cut it. I used the hot glue gun to glue down the ribbon every few centresmetres. I left it to dry. I add an extra few dobs of glue to the rose to help stabilise flowers. There was a few gab so I filled these with the black leaves to hide the wholes I glue these down. I wasn't happy with how messy the back of the headdress looked, so I hand sewed all the petals together to hid the glue dobs. Warning be careful while using the glue gun I got blisters. This is the final reveal. I wore this out last month when the boyfriend and I went to Castle Noir. I got some lovely compliments about my headdress. I forgot to take photos as I was feeling ill and looked like death. It was a good night. Oh, it's GORGEOUS! Well done -- worth a couple of blisters, I'd say. Hot glue guns are the worst, aren't they, but they sure get the job done. Thank you that's really sweet. It was worth the blisters. At one time my finger and hands could with stand alot of heat. It no longer the case, despite burning myself numerous times I never can get used to the pain. I can't live without my hot glue gun now. Beautiful headdress, it looks lovely on you. I never learn to keep my fingers out of the hot glue. I just use the low temp setting so it doesn’t burn as much. Thank you thats so sweet. My glue gun is just a cheapy job and doesn't have a temperature setting. I just need to avoid my fingers in future. Lol. Ha ha - feeling ill and looked like death - a good night. Love that headpiece - it is beautiful and adds an air of elegance. Thank you. I never thought it added elegance but I guess ut kind it does. I think I kind of look like death from Shakespeare's Sister Stay. I've seen reviews of the in-store headresses and many of them are also glued together. You did a great job on it-looks perfect! Thanks its great to hear it looks good. I've not really read many reviews I think it looks just ss affective as store bought one maybe I should purchased better style roses. You do look like Death in the Shakespeare's Sister video! Looks fabulous. Jane. Oh that's a shame if its giving you problems just leave a comment via facebook.Thanks that's so sweet. It was lovely seeing you on Friday. I hope you and your hubby have a lovely Christmas and New Years. Hopefully, see you in the new year but not as long this time. These headdresses are stunning and I love the one you made Sarah! You look beautiful in it! Sorry about the blister! I love glue guns, but you have to be careful! Big Hugs! Big hugs, I love some the headresses but alot are very expensive. Thanks, I'm glad you like it. Wow, it's lovely! I've been admiring headdresses too and want to make some of my own! Thanks that's very sweet of you to say so. You should give one ago. Paint It Black; Beside drawers.